I’ve been traveling through northern Peru and I’ve made some SDR recordings along the way – medium wave, long wave, and some shortwave meter bands. I hope to eventually get through them all! I have also uploaded some recordings to a shared Google drive so that other DXers can hear what the bands sound like in northeastern Peru, on the edge of the Amazon jungle. Maybe some of the blog readers would be interested in this. You will need the below link to see the SDR files and an explanatory document. I plan to add a few more once I get another hotel with a good Internet connection again. Fantastic, Don! Thank you for sharing your spectrum recordings! Post readers: If you don’t already have HDSDR installed on your PC, you’ll need to grab it here. 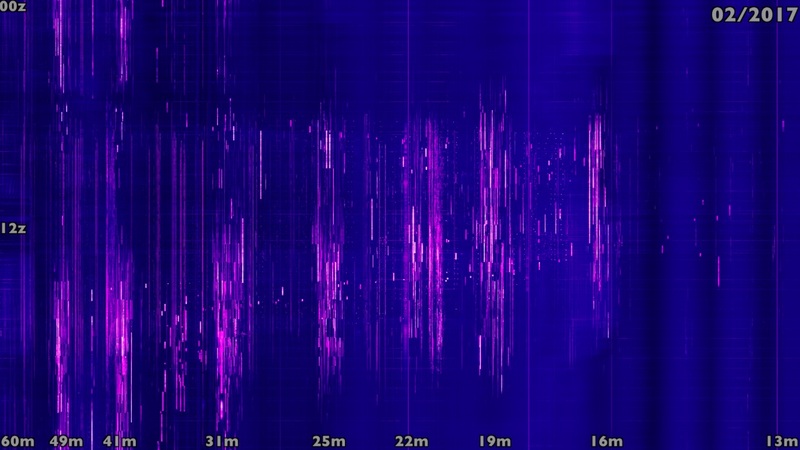 HDSDR is free and can playback these spectrum recordings. Once installed, simply press the “play” button on the HDSDR console and point HDSDR to the downloaded spectrum file. You’ll be tuning through Peruvian spectrum in no time! This entry was posted in AM, Longwave, Mediumwave, News, Shortwave Radio, Software Defined Radio and tagged Don Moore, HDSDR, Peru, SDR, SDR Spectrum Recordings, Software Defined Radio, Travel on December 14, 2017 by Thomas. SDR Spectrum to Radio: Can someone please make this device? The venerable RF switch box from the 1970s/80s allowed game consoles and computers to use analog TVs as monitors. As I’ve mentioned in the past, I actively record and index radio spectrum recordings via my various software defined receivers. Indeed, I have at least 50 TB of SDR spectrum recordings at the moment–and that number is growing! I was just chatting with SWLing Post contributor, Mark Fahey, and a familiar topic came up: the idea of an RF switch box for radios. The concept is a piece of hardware that re-modulates–converts digital spectrum data from a digital storage device back to analog RF– and injects a signal into a real tabletop radio. How cool would it be to take a spectrum recording from 2008, play it through your Hallicrafters SX-100, Kenwood R-1000 or Alinco DX-R8T, and tune through the 31 meter band? You’d receive Radio Australia, Radio Bulgaria, Radio Netherlands Worldwide, Radio Canada International, Voice of Russia and many other broadcasters that are no longer on the air. Indeed, there’s a strong possibility you might uncover DX you didn’t catch when the recording was first made. I’m enough of a radio geek to know that I would thoroughly enjoy travelling back in time once in a while with a classic radio. Additionally, this device would make it much easier for museums to create kiosks where visitors could tune through recordings of, say, important events in history. Icom uses recorded IF instead of live antenna input so customers can experience “contest conditions” while evaluating a radio. The Radio Time Machine injects recorded analog RF, from a HiFi VCR, into the antenna ports of a vendor’s various transceivers. The recordings are typically of a ham radio band during a contest–that way, the customer can get a sense of how well the rig would perform under crowded band conditions. These devices have limitations: while their bandwidth is ample to tune through the CW or phone portion of a ham band, it’s much too narrow for most broadcast bands. They’re also fed the recording from an analog HiFi VCR. The device Mark and I dream of would convert digital spectrum files–from a WinRadio, Perseus, Elad, SDRplay, Airspy or other SDR–into analog RF any radio with an external antenna port could tune. SWLing Post readers: you’re a diverse and knowledgeable community–please comment if you know what it would take to develop such a device and how it could be done. Is this a dream or could it become reality? This entry was posted in Articles, News, Shortwave Radio, Software Defined Radio and tagged Mark Fahey, Radio RF Switch, RF Switch, SDR RF Switch, SDR Spectrum Recordings, SDR Spectrum to Radio, Spectrum Converter, Spectrum recording on October 11, 2017 by Thomas. This article originally appeared on the London Shortwave blog. As many of my readers and followers will already know, these days I mostly enjoy listening to shortwave radio via the outdoor spectrum captures I make in my local park. Although I have built a system that helps me deal with urban radio interference at home, some of the weaker signals still can’t make it through the indoor noise. Since I have a limited amount of time for making outdoor trips, capturing entire portions of the spectrum allows me to record a lot of shortwave signals simultaneously, which I can then explore individually at a later time. However, these trips still need to be carefully planned because the time of the day and the time of the year both affect long-distance signal propagation, and do so differently depending on the frequency range. For example, signals on the 16 meter band are usually at their strongest during the daylight hours, whereas the 31 meter band is at its busiest around sunrise and sunset. Because my current portable recording set-up allows me to capture only 10% (3 MHz) of the shortwave spectrum at any one time, I decided to carry out a systematic exploration of activity on the shortwave bands to help me time my outings so as to capture as many signals as possible during each trip. 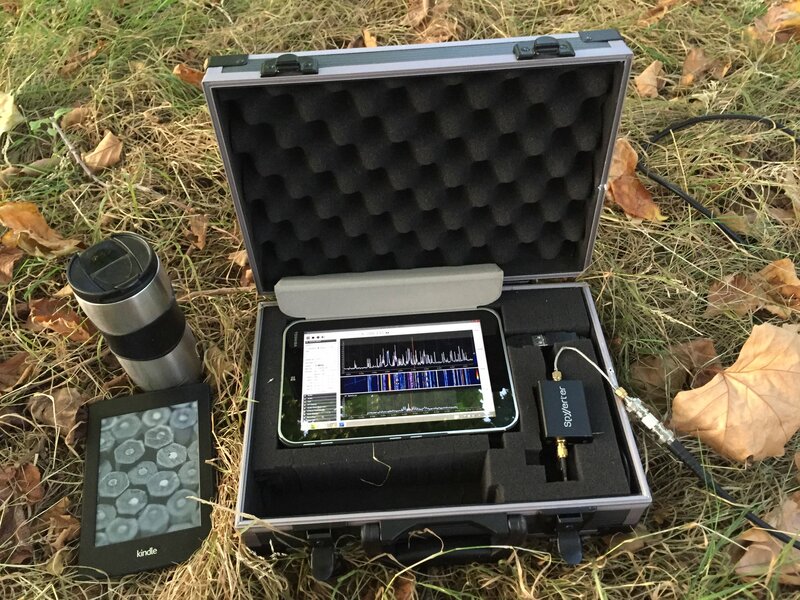 Capturing the shortwave spectrum out in the field with a portable SDR set-up. Luckily, I didn’t need to make any of my own measurements for this. For over a year, the wide-band WebSDR at the University of Twente has allowed its users to see what the shortwave spectrum has looked like over the past 24 hours in a single image. More recently, however, the creator of the service, Pieter-Tjerk de Boer PA3FWM, has opened up his spectrum image archives, so it is now possible to see the past conditions of the bands on any single day in the last two years. Intrigued by how band activity changes depending on the time of the year, I created a timelapse animation of these images by taking two from each calendar week and lining them up in sequence. With Pieter-Tjerk’s kind permission, I share this animation below. This entry was posted in Software Defined Radio and tagged London Shortwave, Propagation, SDR Spectrum Recordings, Software Defined Radio on February 13, 2017 by London Shortwave.